Perfect for daily personal need or to show on a larger screen for a public event. 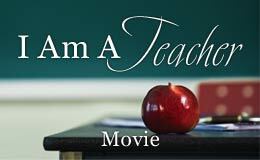 You can purchase and download I Am A Teacher Movie right now. This is a higher-quality presentation, with higher-resolution photos and full stereo sound. The latest in Mary's breakthrough "Make A Difference" series of movies, I Am A Teacher Downloadable Movie, based on the book by John Wayne "Jack" Schlatter, is a favorite. The powerful images and message combined with the uplifting music is what renews your mind and spirit. Screensaver is compatible with Windows only. hi-resolution displays and projectors. For comparison, the online version is 540x360 pixels. 1. Flash Self-Player for PC. Download this file to a Windows PC, and when you double-click it, a player will start, and the movie will play. Player does not have play/pause or slider controls, but is the simplest to use. [Ctl][F] will make it cover the whole screen without borders. Best for playing on a projector for group viewing, and simplest for the novice user. 1440 x 1080 format. 3. Windows Media format. This file format will play only on PC's. Requires the free Windows Media Player from MicroSoft. Player has play/pause and slider controls. This one is the easiest to integrate into Power Point, Media Shout and church-service automation systems. 720 x 480 format. 4. iPod, iPhone, iTouch, Zen, Zune and other Personal Video Players and Cell Phones. Choose your player type at the time of download. I Am A Teacher Movie Presentation Download - Computer file to be Downloaded. As soon as you have gone through the payment process, the final screen you see will have a link for the immediate download of the movie file. So look for the word "download" in blue, underlined, and click on it to start the download. “I was born the first moment that a question leaped from the mouth of a child. Throughout the course of a day I am called upon to be an actor, friend, nurse and doctor, coach, finder of lost articles, money lender, psychologist, substitute parent and a keeper of the faith. I am the most fortunate of all who labor. I know that what I build with love and truth, will last forever. I am privileged to see that life is reborn each day with new questions, ideas and friendships. And who do I have to thank for this wonderful life I am so fortunate to experience? You, the public and the parents who entrust to me their greatest contribution to eternity, their children. I have wept for joy at the weddings of former students,laughed with glee at the birth of their children and stood with head bowed in grief and confusion by graves dug too soon for bodies far too young. I have a past that is rich in memories, I have a present that is challenging, and fun, because I am allowed to spend my days with the future.